The Prince of Wales is visiting the University of Liverpool today, alongside Honorary Graduate and President of Ireland Michael D. Higgins, to formally cement their roles as joint patrons of the University’s Institute of Irish Studies. The visit takes place this morning. 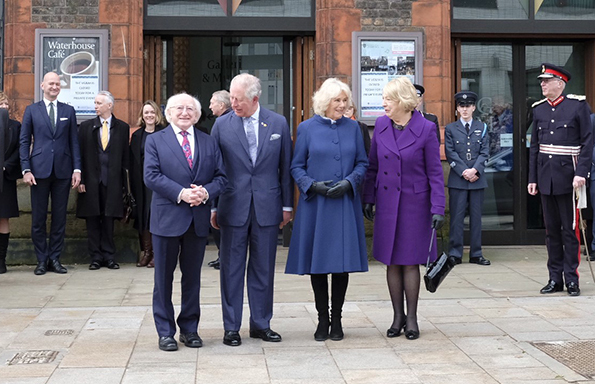 The Prince of Wales will arrive with The Duchess of Cornwall and meet the President and Sabina Higgins at the University’s Victoria Gallery & Museum(VG&M). The party will then meet Institute of Irish Studies staff, students and academics; including Director of the Institute of Irish Studies, Professor Peter Shirlow FaCSS and Head of Department, Professor Lauren Arrington. Professor Dame Janet Beer will formally welcome the party, before Professor Peter Shirlow delivers a speech to mark the occasion and Professor Frank Shovlin reads a letter from John McGahern to Seamus Heaney. The patrons will meet with representatives from Liverpool Irish Centre, Irish Community Care (Merseyside), Liverpool Irish Festival and Irish businesses, as well as Irish Special Needs teachers working in the region, and donors, friends and alumni of the Institute. Following this, The Prince of Wales and President Higgins will sign the joint patronage agreement. Professor Peter Shirlow said: “The joint patronage of His Royal Highness, The Prince of Wales and President of Ireland Michael D. Higgins is an indication of the Institute’s role in Liverpool and further afield. “The visit highlights the importance of the linkage and mutually enriching relationships that today frame the culture and development of these two intertwined nations. “The Irish have been the largest source of in-migration to Britain for over two centuries and as many as six and a half million people in the UK are estimated to have at least one Irish grandparent.